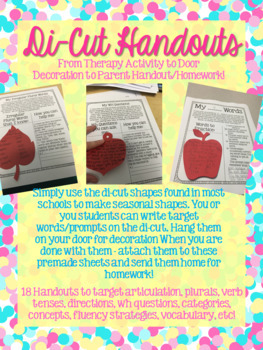 Speech and Language Di-Cut Parent Handouts! 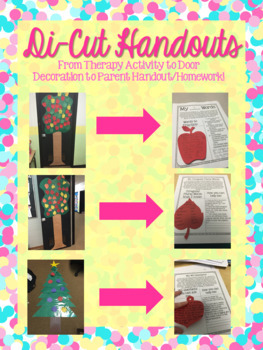 Planning therapy activities, seasonal decorating, and parent communication are three areas of my job that seem to take up a ton of time. But they are all so important. In an attempt to make my life a little easier - I came up with a way to target all of these at once using di-cuts and these handouts. Step 1 - Cut out seasonal di-cuts. Have your students brainstorm target words/prompts to write on the dicut. This is a great opportunity to talk about what they are working on in therapy and to help them take ownership of their goals. Step 2 - attach to your door. I had apples and leaves on a tree, ornaments on a Christmas tree, mittens on twine, shamrocks/eggs/flowers hidden in "grass," and fish swimming in a sea. Step 3 - When you are ready to move on to the next season, take down the dicut and attach them to these handouts. Send them home and you've got parent communication done. These handouts provide a space for the di-cut. 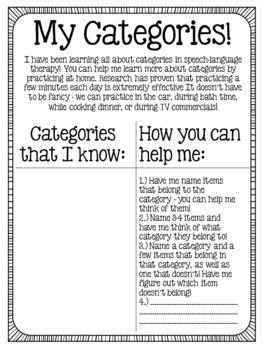 But they also provide easy activities for parents to do at home - along with prompts and ideas for moving forward. It highlights the importance of practicing a little bit each day. I have gotten excellent feedback from my parents. 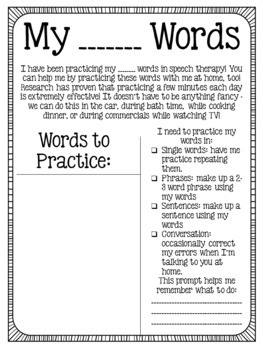 This packet contains 18 handouts for articulation, categories, object functions, quantity concepts, describing words, spatial concepts, temporal concepts, fluency strategies, multiple meaning words, body part/clothing vocabulary, generic vocabulary, following directions, wh questions, irregular plurals, regular plurals, irregular past tense, regular past tense, and present progressive verbs. Di-Cuts are not included.